I affectionately refer to myself as a Euro-mutt. That’s right. I’m a mutt. When someone comes up to me and says, “So, where does your family come from?” I typically give a blank stare and say “um, here…”. Trust me, my dad is a geneology freak buff and I know this to be true. My “people” came to this country before it was a country. I do not say this to brag, in fact I often wish there was a bit more cultural heritage (FOOD) to celebrate, but it is what it is. Nevertheless, I wanted to give you all a green treat for the holiday. (Hey, I do really like green, does that help?) 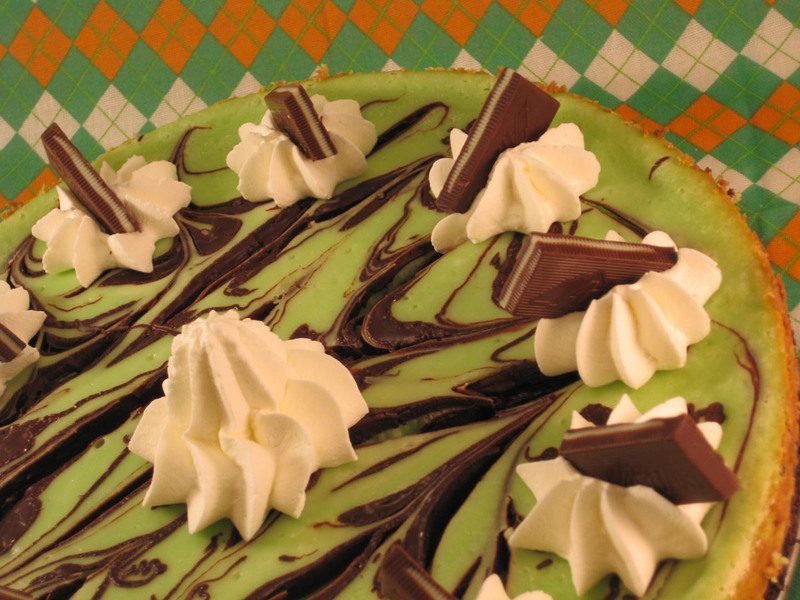 So, without further ado, behold, a Grasshopper Cheesecake! In a large bowl, mix crust ingredients with a fork until crumbly. Press into the bottom and 1″ up the sides, of a 9″ springform pan. Bake for 12 minutes. Cool at room temperature for 30 minutes. Melt chocolate in the microwave for 45-60 seconds, stirring halfway through and every 15 seconds thereafter until smooth. Set aside. Pour filling evenly over crust. Drop 8-10 spoonfuls of the melted chocolate randomly onto the filling, allowing it to sink in. Using a knife, cut through the chocolate and filling to make a marbled pattern. Bake 1 hour 10 minutes, or until set 2 inches from edge of pan. Then, turn off the oven and allow the cheesecake to cool in the oven with the door slightly ajar for 1 hour. Cool at room temperature for 1 hour, refrigerate for 3 more hours. Garnish with whipped cream and candy, if desired. 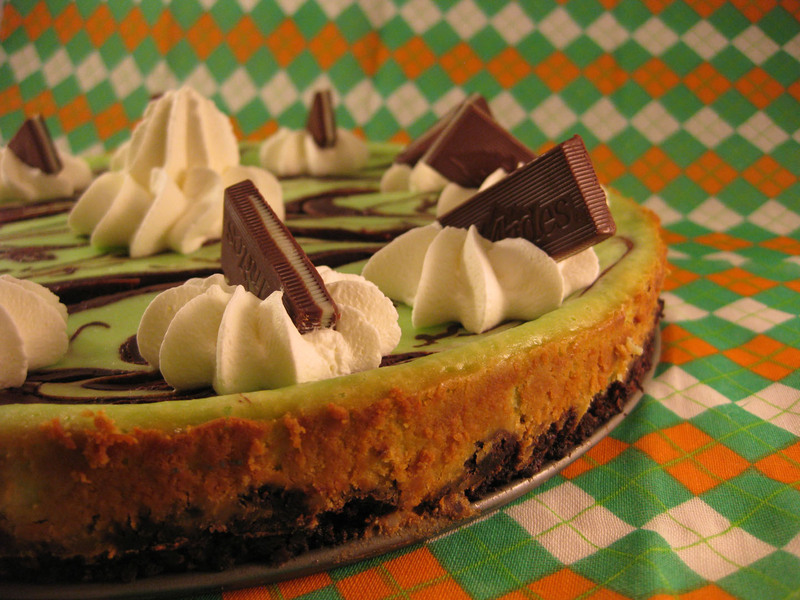 This entry was posted in Baking Jumbles and tagged cheesecake, chocolate, grasshopper, mint, st. patrick's day, thin mint. Bookmark the permalink. Must try this recipe! It looks delicious! FYI, yes, you are a Euro-mutt. But you have Irish heritage on both sides of your lineage! When we were in Ireland, we visited several sites that were home towns of our ancestors, including a castle! Also, please note that not ALL Irish are Catholic. Northern Ireland is mostly Protestant (Church of Ireland, similar to Church of England). And, although we saw many drunk Irish people at a festival in Galway, the rest of the Irish people we met were friendly, civil, and sober.